The best thing about being part of a community with other amazing, creative women is seeing the way we all manage to lift each other up– focusing on celebrating one another’s success. That’s why I really enjoyed taking part in the most recent episode of The Brava Podcast. The word “Brava” actually means “to applaud women” and it was incredible to take part in a podcast that focuses on celebrating women’s successes. If you’re all about that, definitely check out the full conversation I had with the lovely Stephanie, who hosts the podcast. There are plenty of other inspiring episodes, and I wanted to share 5 highlights from our conversation here on the blog. Make your dreams a reality! It doesn’t matter how many ideas you have, it matters how many ideas you make happen. Don’t abandon the things you love because they seem impractical. Chase after them. Reject the “B-word” – aka stop being “busy” all the time. I don’t believe in being busy all the time because it can equate to feeling rushed and overwhelmed and glorifying the trend of the “hustle.” I really do have enough time for all the things I want to do. If you read my blog or follow me on social media, you won’t be surprised to hear me say how important it is to give yourself permission to create. Give yourself grace. Personally, it’s easy for me to give grace to other people and see the best in them. I have a much more difficult time doing that for myself and I know I’m not the only one. I’m working to be as kind to myself as I try to be to others. Let go of perfectionism and embrace your own abilities. You don’t have to do more to be more. Each of us is already more than enough. I love all of these tips but the conversation on the podcast episode is loaded with even more juicy inspiration! Please take some time to check out the Brava Podcast and spend some time applauding yourself and all the other crafty awesome women in this world! Jen Sincero’s book is a New York Times Bestseller— so it should come as no surprise that it spoke to me and the million others who purchased it. It can be a challenge to approach life with confidence and eliminate doubt. 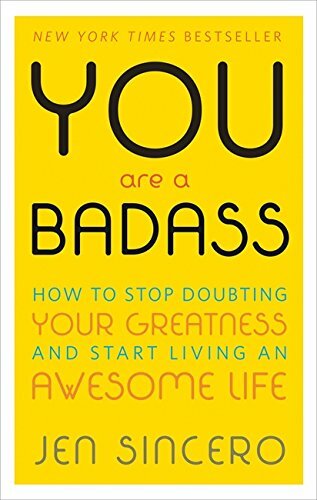 But You Are A Badass gives concrete examples, strategies, and ideas to do just that. It spoke to me on a personal and professional level because it is chock full of great ideas. I came up with a list of 5 reasons I think you should read the book and see for yourself! 1. It promotes self-exploration. Jen discusses how we come to be and what forms us as human beings. She writes that, “our thoughts become our words, our words become our beliefs, our beliefs become our actions, our actions become our habits, and our habits become our realities.” This spoke to me not just because it’s true, but because it helped me think more about the impact my attitude has on my words and actions. It can be easy to float through life without asking yourself the "why?" behind your thoughts and feelings. 2. It advocates for inclusivity. A fulfilling life isn't reserved for some people. She writes that, “…every single person is born with unique and valuable gifts to share with the world…Living a life on purpose is available to everyone.” This spoke to me because it falls in line with what I have always believed— we all have different and beautiful ways to express ourselves and our talents. 5. It’s honest and persuasive. Jen doesn't scold or sugar coat. In fact, the book is written in a no-nonsense tone that will make you want to give the author's ideas a chance. You Are A Badass is never over-complicated and the language makes it accessible and easy to understand for everyone. So... have you read You Are A Badass? What did you think? Will you give it a try after seeing my five reasons? Let me know in the comments below.